greatjencreations: Being Violin Mom, Part 1. Being Violin Mom, Part 2. Being Violin Mom, Part 1. 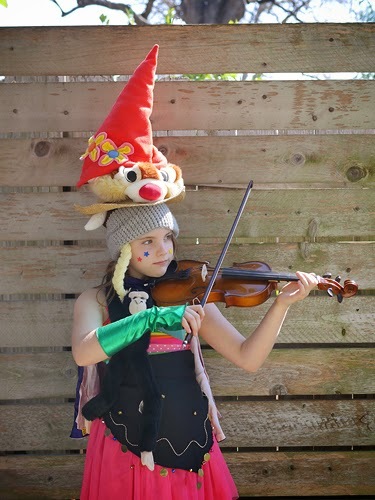 I've been thinking a lot lately about what it means to be the parent in charge of Suzuki violin. I've never homeschooled, but I imagine that there are some significant similarities between homeschooling and being Violin Mom. In the case of homeschooling, however, learning likely happens when everyone is rested and fresh, unlike the music learning in our family, which happens when everyone is exhausted and rushed -- not the ideal circumstances for any sort of education and certainly intensifies the challenge. There's just too much to say about Being Violin Mom for one post. 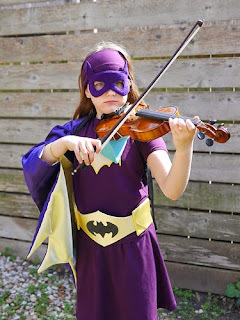 So this post tells how I got here and what it means, to me, to be Violin Mom. The next will be what I've learned and why I keep doing it. So first, how I became Violin Mom. My daughter started begging to play violin when she was four. I let her pester me for an entire year before I seriously considered the idea. Although I played flute/piccolo and loved band (even played for a while in college), I knew nothing about string instruments or orchestra. I feared fitting music practice into our already hectic and busy life. I dreaded having to attend every lesson and be the home-teacher and whip-cracker. I hated the thought of practice battles and enduring the inevitable frustration that accompanies learning a new instrument. I finally gave in when my daughter started making violins out of cardboard boxes. I had so much trepidation about beginning violin that I sought out a teacher who would not follow the Suzuki Method precisely but would be a bit more flexible. She was less formal about CD-listening requirements than other teachers. She did not have a strict practice policy or require group classes. She would come to our house. She's the daughter of a violin teacher and the sister of an accomplished violinist. She plays both classical music and traditional fiddle music. It all sounded perfect. But it wasn't. During lessons, my daughter was very distracted -- what is my brother doing? what is going on in the next room? what can I play with? The teacher tried hard to engage her with fun games and rhymes and challenges. But mostly it didn't work. During practices, my daughter was grumpy and resistant. She was finally doing the thing that she'd been desperate to do for over a year, and none of us were having any fun. Sure, there were small successes. But they were overshadowed by the slumped posture, the sour face, and the inevitable struggle prompted by they mere mention of "violin." Was she just too young? Was it just too hard? I didn't know. What I did know was that we were all out of energy and out of patience. So we took a summer off to see if we had what was needed to continue. Obviously, we did continue. We ended up switching to a new teacher (recommended by the first), who has a nearby studio. I still don't know what exactly changed and how we got back on track. Maybe it was doing lessons outside of our house, in a space filled with positive energy and light that's designed around learning violin. Maybe my daughter grew up a lot that summer. Maybe I grew more patient. Or maybe it's that I bought into Suzuki Method and accepted my role as home-teacher. Whatever happened -- probably all of those things -- I'm thankful because I have no doubt that a great deal of good has come from it. I have to make violin happen. I initiate practice (though I must use positive words like "let's make music" rather than more negative ones like "you need to work on violin"), I nag until the violin is out of its case, I set the practice structure and define practice goals, I determine repetitions and drills, I police posture, I attend lessons and take notes, I make sure we make it to group classes. I try to create a positive learning and playing atmosphere. I do my best to be encouraging and compassionate and creative. When I sense my daughter's attitude is suffering or she's feeling defeated, I find a new place to practice or turn to games and challenges. I pull out dice and bead counters and stuffed animals and whatever else I can think of because I know that sometimes it's important to shake things up. I find an audience for her to play for. I issue challenges that set my daughter up for success because I know that accomplishment fuels motivation. I tread carefully between building up my kid's confidence, commiserating and soothing when she feels crushed by frustration, and firmly pressing ahead when it's the last thing we want to do. When I'm feeling especially worn down by it all, I read articles and message boards, looking for fresh ideas and inspiration. I shoulder all of this responsibility knowing that if I don't follow through, my daughter will not learn violin. Suzuki is pretty honest about the fact that a child's success or failure depends on a parent's ability to bear this burden. The fate of a child is in the hands of her parents, he says. Any child can be developed, it just depends on how you do it, he says. Creating desire in your child's heart is the parent's duty. Every child grows; everything depends on the teacher. No pressure there. Nope. Practice only on the days you eat, Suzuki said. I wonder, was Suzuki in charge of preparing food for children to eat, for buying the food, for cleaning after meals, bathing children, and washing the laundry soiled with food remnants? All after a hard, long day of difficult work? I suspect not (though I do not bear that burden alone either; I am extremely fortunate to have a partner in all of those tasks). Make it a habit, just like brushing your teeth, Suzuki teachers say. But my law brain is quick to draw all sorts of very valid distinctions. It's simply not the same. Still, I recognize the undeniable benefits of daily practice. I know that if you can get a child to play for five minutes, they'll probably play for much longer. If you can get into that music space, most of the time good things will happen. So six days a week, I try very hard to have a productive practice. Nobody's perfect; homework and family obligations sometimes get in the way, and I often give myself a pass on Fridays because end-of-week exhaustion tends to make productive practice impossible. So I drink wine, celebrate having survived another week, and try not to think about it too much. But I still feel terribly guilty because we eat and brush our teeth on Fridays. This is what should be happening in any one practice: (1) review pieces already mastered, not just to keep them fresh, but also to improve skills for current and future pieces (we've got about 25 review pieces at this point, so no easy task); (2) memorize a new piece, or maybe just "noodles" of a coming piece; (3) polish a piece so that it's performance- ready (bowing! dynamics! style! ), which is the standard for truly moving on to the next piece; (4) skill work like scales, reading music, vibrato, bowing drills. On all of these things, repetition is crucial. Suzuki is serious about this -- Repetition is the key to success, he says. Knowledge plus ten thousand times is skill, he says. So we play things over and over again. Maybe not 10,000 times, but a lot. Here's the tough part of this. What's missing from that practice list? (5) If there's time, play just for fun -- write a song, experiment, sound out a song you've heard. I don't want to imply that Suzuki does not believe in violin being fun -- quite the contrary! An unlimited amount of ability can develop when parent and child are having fun together, he says. But the reality is that there's only so much time and so much energy and so much patience. There's only so much we can do. Every day, review + memorize + polish + skills. Every day, figure out if there's time for fun. Every day, decide out how far we can push bedtime, whether the kid can go without a shower or without reading before bed, whether we let chores slide. All because I want to allow a bit of time for my kid to be a kid, to just play. For fun. But so many days, we end practices without ever getting to that important item (5). So many days, so much guilt for too little fun. So there you have it -- a peak into the Violin Mom part of my life. If after reading this you're wondering why in the world I'd put myself through all of this, then stay tuned. More on that to come. Thanks for being such an amazing mom!!! I don't know how you do all that you do, but it is very refreshing to know someone is capable of such feats. I look to your example often for inspiration on a journey that still hasn't begun for me, but one in which I'll embark on soon. Thank you! Thank you for these great posts! Wonderfully written Jenny! Any day now Danielle will finally get to bring her violin home - she is excited and I am worried how we will fit this new adventure into our already crazy routine. If I can be 1/2 the violin mom as you are, I'll be happy!